Cast Iron Flank Steak is the perfect weeknight steak dinner. Economical, lean and high in protein, flavorful and cooks in under 10 minutes. High-quality beef is a normal of our weekly meal plan because of the nutrition it provides. 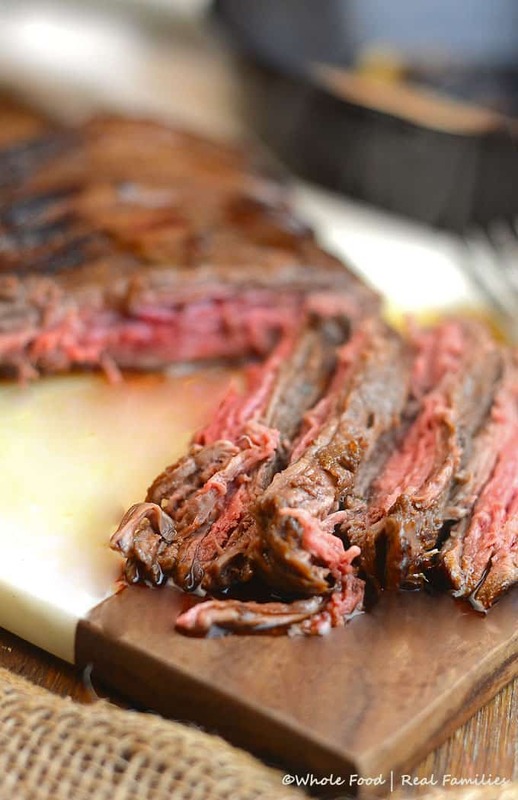 But this Cast Iron Flank Steak makes it into the dinner rotation often because it is lean, healthy and all my kids will eat it without complaining. The steak marinade is super easy and it doesn’t hurt that it cooks for under 10 minutes. You know dinner is quick when the main entrée is on the table and you are still waiting on the green beans to finish cooking. So here is a handy little tip: to properly prepare a Cast Iron Flank Steak, you must have a cast iron skillet. (Yes, I know. Shocking, right?) I have more pots, pans, and skillets and kitchen gear than I will ever admit on this website. You might call me a collector (hoarder). But nothing works better than a good old fashioned Lodge Cast Iron Skillet. While there are plenty of cast iron skillets that will cook as well, I just don’t know that any of them will ever beat the value. This is the 15 inch Cast Iron Skillet that is my go-to when searing larger pieces of meat. It is big enough to handle the job. A little heavy. And awesome. A word about Flank Steak. The universe means for it to be cooked medium rare. If you are super picky about your steak being cooked at a higher temperature than that – first, I am sorry. Secondly, you might be able to cook a high-quality flank steak to medium but no further. The fat that naturally occurs in other cuts of beef is what makes them so tender. Flank steak is VERY lean, making it a great, healthy choice. But it will also chew like an old shoe if you cook it to well done. Trust me, medium rare. I promise you are going to love it even if you prefer other cuts cooked to a higher temperature. I mentioned this flank steak marinade is super easy to make. The ingredients are probably in your pantry already. Just whisk olive oil, soy sauce, vinegar, garlic, pepper, and honey until the honey dissolves and it becomes a uniform marinade. Just pour it over your meat in a shallow dish, making sure it is coated thoroughly. Cover and refrigerate overnight or for whatever amount of time you have available. I have marinated flank steak for as little as 15 minutes and as long as overnight. Both are delicious. Obviously, the longer it sits in the marinade, the stronger the flavor will be in the meat. If you can’t find flank steak, skirt steak makes a great alternative. 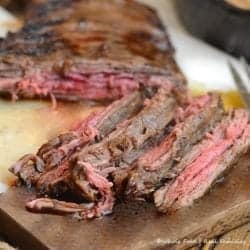 Use the same cooking method and marinade but make sure you remove the thin membrane on the back side of the skirt steak. Many butchers leave it for you to deal with so double check! If you leave it on, your steak will be significantly tougher. Also, cut skirt steak thinly against the grain. That means cut the steak at an angle on the long side, not the short side. It seems weird, I know. But you will end up with a big beefy flavor that is tender enough to eat rather than chew indefinitely. Also, note that flank steak and skirt steak are not the same things but grocery stores often confuse them and label them interchangeably. Because this Cast Iron Flank Steak cooks so fast, we often cook more than we will eat at one meal. Save the leftovers for flank steak tacos, fajitas, steak and eggs, thin slice for an awesome steak sandwich. Of course, to make this plan work, you have to leave the extra steaks in the kitchen and store them in the fridge before anyone sees them. Looking for more great beef recipes? 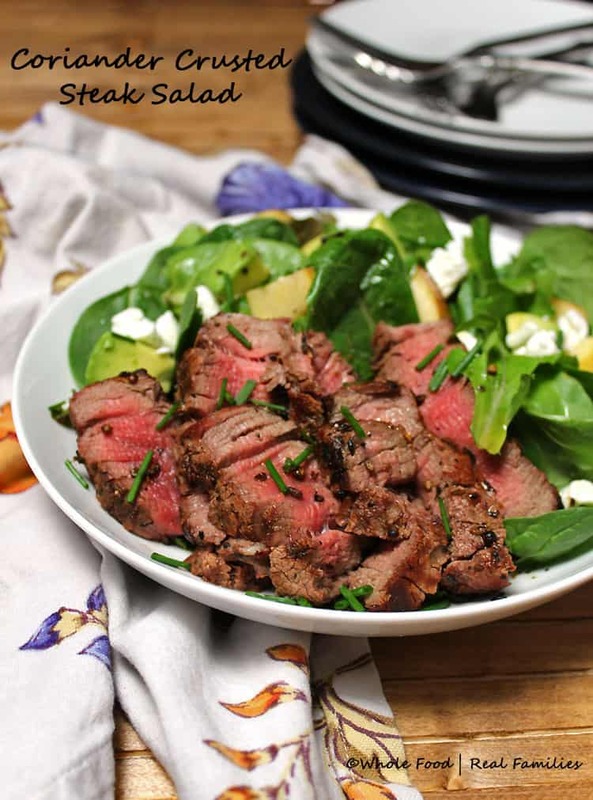 This Coriander Crusted Steak Salad is also perfect for weeknight meals and is so delicious! These Easy Beef Empanadas are a favorite of my kids! Still Feeling Beefy? Try this Oxtail Soup Recipe too! I have not explained to my kids what an oxtail actually is so as far as they are concerned it is just a super flavorful beef stew. Whisk olive oil, soy sauce, vinegar, garlic, pepper and honey until the honey dissolves and it becomes a uniform marinade. Place meat in a shallow dish and pour marinade over meat coating it thoroughly. Cover and refrigerate overnight or for whatever amount of time you have available. Preheat large cast iron pan to medium-high heat on top of the stove. Place steak in the cast iron pan for approximately 4 minutes. Flip the steak to the other side. Look for pink beads of moisture to appear on the steak - that is a good indicator of medium rare. Cook 3-4 minutes and remove. Let steak stand for 5 minutes before slicing thinly. Serve and enjoy! Discard marinade. So I’m guessing that this is not something that can be marinated for a mere 30 minutes? I know the flavors would be much better the longer it’s marinated, but……what if I want to make it that same night? I have absolutely marinated this for 30 minutes for the same reason. Ideally, longer is great but part of the reason I love flank steak is I can throw it together on a weeknight! This looks so good! It mentions garlic in the instructions but there is no garlic in the ingredients list. Can you please clarify this for me. Thank you! I added a table spoon of chopped garlic to mine tonight. Great recipe, but the steak pictured is cut with the grain, not against the grain, whoops. I know! But you are the first person to call me out on it! I learned the hard way to cut against the grain. LOL! This has been on my reshoot recipe forever. I think it is about time I got to it. Your steak looks amazing. It’s one of my favorite meals! Thanks for joining Delicious Dishes Recipe Party! Hope to see you back again TODAY! The party is now open and waiting for you!